Home » Courses » Live Events » Get Started Animating with GSAP Tween Library. The GSAP library is a massively popular library that is used by the largest cooperations in the world to create interactive visually stimulating animations with ease. In this hour session we will learn the foundations of this wonderful animation tool and by the end of it you will know the basics of how to animate via code. The first step is for you to download the course files of the library you can find them on the GreenSock website. A quick intro to the GSAP library. In the library you will find many classes/files as such lets walk through the basic packages and classes you will find in the package. 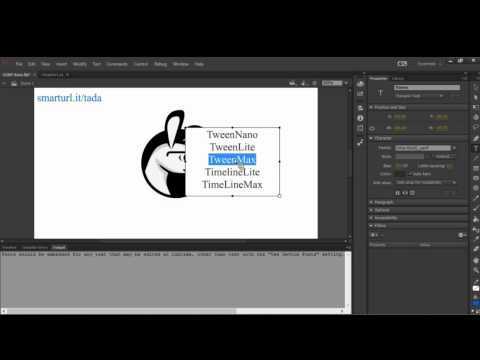 We will explain the main animation libraries: TweenNano,TweenLite,TweenMax, TimelineLite and TimelineMax. TweenNano is a super-lightweight version of TweenLite and is ideal for situations where you cannot afford the extra 3.1k of TweenLite engine. TweenNano can do everything TweenLite can do with a few limitations. It is recommended that you only use this library in cases where you must meet a low KB (such as banners) and when there isn't a need for interactivity of the animations. One of the questions we where asked during this live event was %u201Cis alpha 0 and visibility at false the same?%u201D. There not. In this video we will talk about what that actually means and see how do we sort out the issue of having items on the screen with an alpha of 0. As we continue our lecture we will learn how to animate non visual numbers to create visual effects. For example we will see how to create a typing effect(one of my favorites). As animation online is all about interactivity we will dedicate a few moments to talk about how to create interactive animations and see live how we can get that done. We end this live event with a live Q&A session.